WOOD SPECIES. We locate and install all major species of wood and species that can be hard to find. Wood flooring comes in several different lengths, widths, and thicknesses. 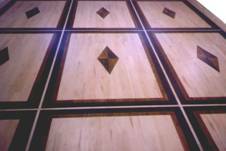 Many products used for floors today are made of materials added to wood for various effects, especially pre-finished flooring. Wood species can be most attractively installed when 2 or more are combined for an artistic effect on floors. This effect can also be accomplished by Julius Ascue when using stains to give the appearance of a change in species. Please stop by our showroom or call for your in-house estimate.